I simply love the state of technology these days, despite a lot of this stuff - in the larger scheme of things - being in its infancy. My only regret is that I will likely not live long enough to see the "Star Trek-y" stuff that is certainly on the distant horizon. We are only a few major breakthroughs (like those are easy, somehow?) away from genuine magic. Steps like solving the power vs. size-of-battery problem, the physical limits of traditional conductors of energy, transparent aluminum, just to name a few. One of the most tangible hunks of magic-tech involves one of my favorite pastimes: riding at night. I am ever-watchful for improvements and advancements with regard to LED emitters and the various ways they are packaged. Flashlights with a couple hundred lumens of usable output were hundreds of dollars only ten years ago, and now you can walk into most gas stations and grab something really well made and efficient for less than US$20.00. I know at least three cyclists I frequently ride or converse with who ride tons of after-dark miles per year on nothing more than a couple of $12 flashlights running on AA cells. They're cheap, easily replaced, easily kept alive (AA cells are "everywhere"), and no heart-breaker if they fail or turn up missing. Smart. I won't even get started on the state of the generator lighting systems... that's a whole other post. Click to read on . . . 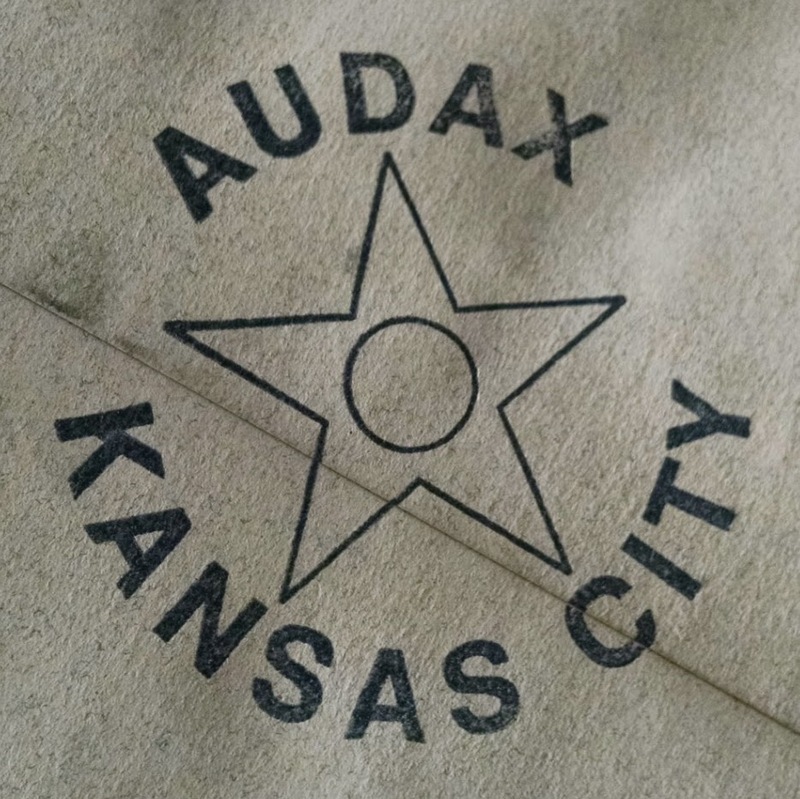 Envelope stamp from local perm coordinator - KC-PRIDE, baby! It's been an interesting couple of months, and I've managed to grab March with a 200K... but, only after missing February... which killed the streak I had from December, which was really killed in January, come to think of it. So.. ride number one, on R-12 #... uh, I dunno, IIRC this will be the start of run #5. April is assured, because now, after long last... the ACP brevet series is NIGH! I love the spring series... even though I missed a great day on March 28th, which is when the 200k unfolded. Still, more on that later on...(maybe) because what I really need to do is recall the events of the March 14th 209km permanent that I'd ridden instead, with Glen and Terry, up north of Liberty, MO. - one route which is becoming a fast favorite, A Mere Two-Hundred. It's been JUST long enough, however, that I seem to have.... hahahah, who am I kidding. Good grief... you know how difficult it is to be me, sometimes? With a mind like a screenplay, well, this is sometimes what you get. Trust me, it's easier to read this than it is to live it. Time to whisk you away to a magical place in my head, where just the right amount of beer begins the unstoppable flow of neurological energy (no, not urological... well, not right away, anyhow.) to allow the storytelling to begin.... sit back, crack a cold one, and prepare yourself for the journey. . .
. . . I knew the day was going to be interesting when I suffered my first crash before the ride even started. I arrived, packed the bike with plenty of time to spare, and proceeded to roll toward the Perkins building itself, up in Liberty, where inside Terry and Glen waited with hot coffee and the beginnings of their breakfasts. Bikes all leaned up against the side of the building, and mine was to be next. But, instead of just being NORMAL, I decided - quietly to myself - that I would just lift-hop the front wheel up and over the short curb, instead of dismounting and lifting it. For some odd reason, I don't know if it was the glasses, a trick of the light, or just bad hand-eye coordination, but, I successfully lifted the front wheel up - no problem there; except that I lifted it about a foot too early, landed the wheel directly against the curb itself, and then - like in slow motion - proceeded to rotate forward, over the handlebars and onto the ground - denting the rear rack and my right shoulder. Awesome. Had to borrow from Steven Williams' photos from yesterday's 322km (200.6 miles at my measure) from Oak Grove to Fayette, MO., here on MO-240 with Josh Stadler and Steve up front on the camera. More details to come - a great route, because its never easy. Never.